Yesterday afternoon some members of Archives for London (AfL) came to visit the archives to find out more about what we do. Once we’d had a chat over coffee, introduced our collections and talked about the work we do on a daily basis to develop the care and use of the archives, we showed them some of our favourite items. One of the files I fetched up was the student record for Sir Tobias Weaver who completed the Teacher’s Diploma here in 1934/5. It would be easy to dismiss student files as lacking in relevant content, just full of administrative correspondence about admissions and registration. But after a closer look you can find a fascinating file that provides a real insight into the relationship between the Institute and its students at the time. Firstly, the fact the front of the file reads ‘One year (private)’ is rather intriguing. 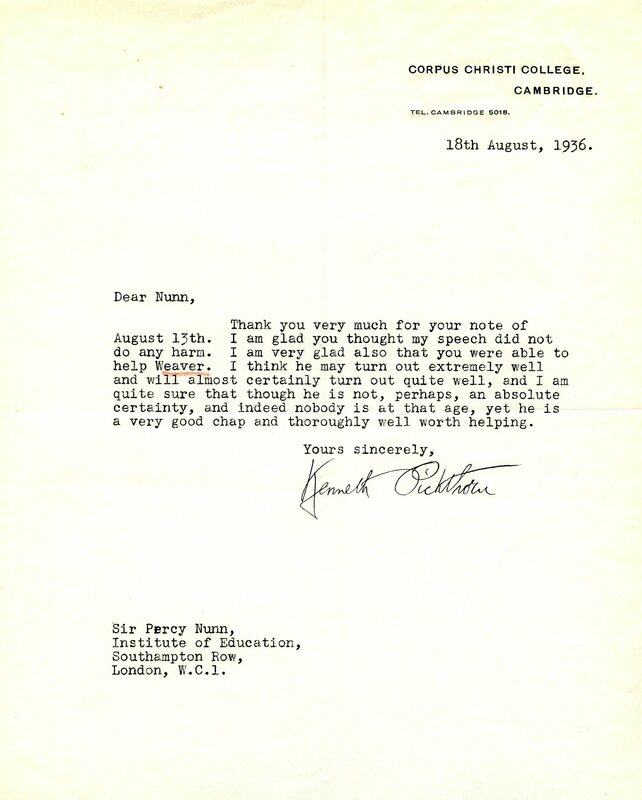 As it turns out Weaver was accepted on the course at the last minute after the Institute’s Director, Percy Nunn, received a letter from K Pickthorn of Corpus Christi College, Cambridge saying that he was ‘quite sure that [Nunn] will never regret it’ if he agreed to accept Weaver. 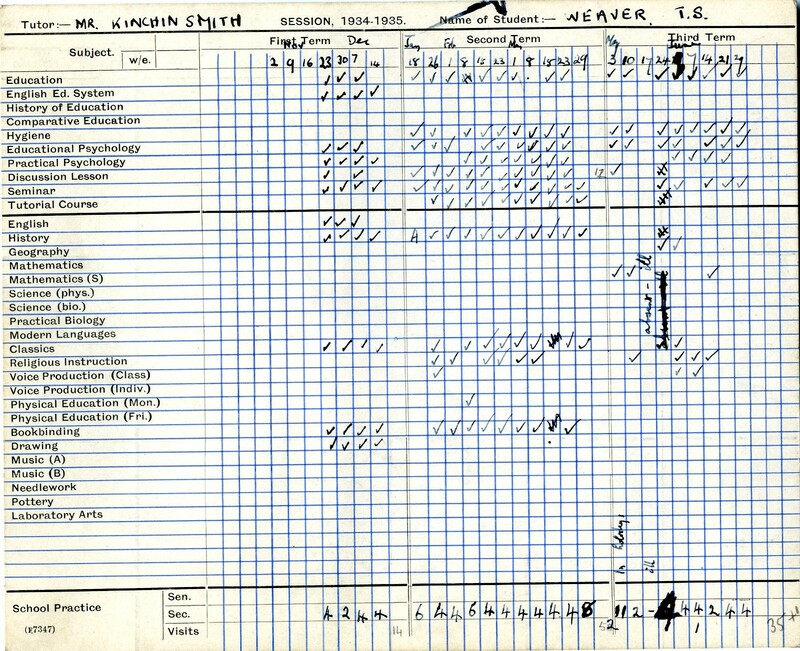 Some of the most interesting parts of the file are the reports on his practical work (i.e. the teacher placements). Although many of the teachers who reported on him agreed he would prove to be a ‘good to very good’ teacher apparently his vocal skills weren’t quite up to the mark. One wrote ‘his voice is too loud and high pitched at present’ whilst another (perhaps rather meanly) simply wrote ‘What is the matter with his voice?’! Compared with today’s teacher training some lessons seem very unusual. What was the purpose of bookbinding for teachers? And just what is Laboratory Arts?! Seeing as Weaver appears to have not attended this class perhaps he thought the same thing.